Ideal for all Woodland, Scenario and MagFed Players, looking for an ultra-compact and extremely lightweight HPA System. The smaller size of the tank makes your marker much lighter and maneuverable especially for Close Quarter Combat Missions. The imprint on the tank (dark-grey) helps you to merge with your surroundings, unlike most other systems on the market, which signal your position due to their bright white imprint. This 0.21litre/13ci aluminum HPA System works with 200 bar (3000psi) filling pressure. The lightweight regulator consists of 3.3206 aluminum. Due to micro pressure gauge the current cylinder pressure can be read at any time so there won't be any nasty surprises on field. Of course, the filling connection is made of stainless steel and the dual burst disc system secures optimum cylinder and outlet pressure. Therefore, any damage to the marker will be avoided. Ideal for all Woodland, Szenario and MagFed players who value a very compact and super light HP system. Reduces the weight of your marker. Perfect for house fights and fights in densely built-up areas. 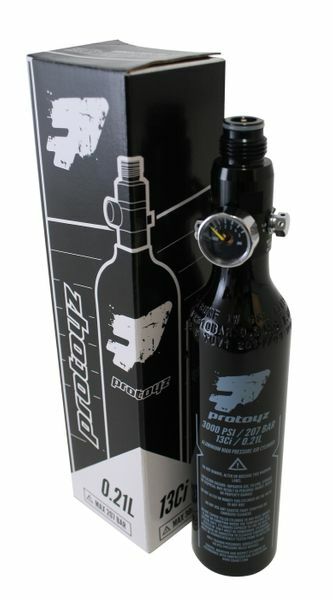 The HP system offers you a filling capacity of 0.21 litres with a filling pressure of 200 bar (3000psi) and thanks to the precise micromanometer, the current bottle pressure can be read at any time. Thanks to the dark grey print, your rival cannot detect you early. In contrast to non Pi certified bottles and regulators (which may only be transported empty or at a pressure not greater than 2 bar on public roads), this system may be moved in public when filled.